Think Spring! Cups Froyo opening in Rockaway, NJ this Thursday! One of my favorite froyo companies– CUPS Frozen Yogurt – That’s Hot™, the beach-themed self-serve fro-yo concept, will open its first franchise location at 7 pm on Thursday, March 28 at Rockaway Townsquare, 301 Mount Hope Avenue in Rockaway, New Jersey. From March 28 to March 31, the Rockaway CUPS will donate 15 percent of sales to the Sandy New Jersey Relief Fund. Also, during the grand opening week, each Rockaway customer will be given a “scratch off” card, which contains prizes such as wristbands, beach balls, water bottles, beach towels and CUPS coupons. One lucky winner will receive free fro-yo for a year. Susan Witham, the Rockaway CUPS franchisee, is a successful businesswoman and long-time supporter of the Rockaway community. 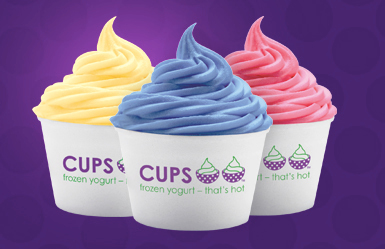 Since opening the first CUPS in Clifton, New Jersey in 2010, CUPS has taken the Tri-State area by storm, becoming the local hot spot for teenagers and adults alike who make their own fro-yo concoctions choosing from 24 yogurt flavors and over 50 different toppings and three sauces. The Rockaway CUPS will be open from 11:00 am to 10:00 pm Monday through Thursday, 11:00 am – 11:00 pm Friday and Saturday and from 11:30 am to 10:00 pm on Sunday. For more information, call 973-328-1730 or visit their site, here. This entry was posted in Jersey, New Jersey, Sara Monica, SCBD, Small Chick Big Deals and tagged cups froyo, grand opening, nj, rockaway, save the date, scbd, small chick big deals by smallchickbigdeals. Bookmark the permalink.